Guide Service for fishing, grouse, bear and deer hunting by a Wisconsin Licensed Guide available. Call us for details. "Grouse Capital of the World", trophy deer, woodcock, ducks and geese. 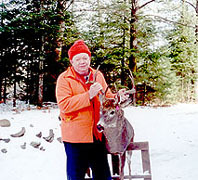 Hunting in the Chequamegon National Forest is among the best in the State of Wisconsin. Be it Deer, Bear, Grouse, or small game; you will enjoy hunting in this area.